Innocence is not cause for exoneration: Scalia’s embarrassing question is a scandal of injustice. 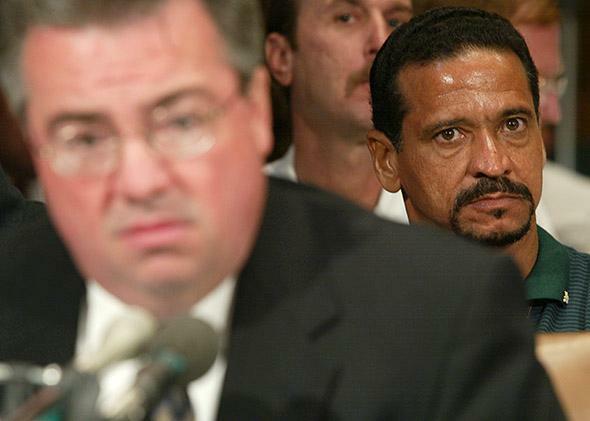 Juan Melendez (right), a former death row inmate who was exonerated, listens to testimony during a hearing before the Senate Judiciary Subcommittee on the Constitution on June 12, 2002, in Washington, D.C. Melendez sat on death row in Florida for almost two decades before a court finally overturned his murder conviction. 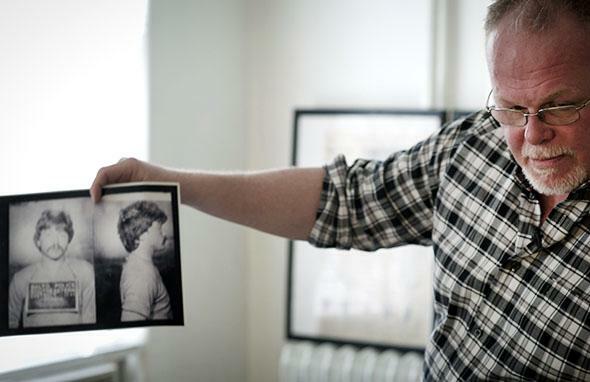 Kirk Bloodsworth shows pictures of the convicted murderer Kimberly Shay Ruffner during an AFP interview in his apartment in Mount Rainier, Maryland, on Sept. 26, 2012. Bloodsworth was the first American sentenced to death row who was exonerated by DNA fingerprinting. By no stretch of the imagination could these biased affidavits—which conveniently blamed the murders on a dead man—prove Herrera’s innocence of the Carrisalez and Rucker murders, the latter of which he flat out admitted to committing. Herrera’s innocence claim, quite simply, was a farce. And yet it was this claim that the Supreme Court chose to review when deciding a profoundly important question: whether any inmate with newly discovered evidence of innocence could argue that his conviction had been obtained in violation of the constitutional guarantees of due process and protection against cruel and unusual punishment. In 1996, things got even harder for convicted prisoners. Congress passed a law declaring that federal courts could not overturn a conviction challenged in habeas corpus petition unless the state court that heard the case first was either “unreasonable” in applying a law that was clearly established by the United States Supreme Court or the state made factual findings that no reasonable person would agree with. The profound impact of the new law, coupled with the Herrera decision, was brought into stark relief in the case of Troy Anthony Davis. Davis, a young black man, was charged with shooting and killing Mark MacPhail, a white police officer who was trying to protect a homeless man from being beaten in a parking lot in Savannah, Georgia. At Davis’ trial in 1991, seven people identified him as the killer, and two others testified that Davis confessed to them after the fact. The murder weapon was never recovered, but bullets and shell casings recovered from the scene came from a .38-caliber pistol. One of the prosecution’s witnesses was a man named Redd Coles. On cross-examination, Coles conceded that he had argued with the homeless man on the night of the crime and that he owned a .38 pistol. The jury convicted Davis in less than two hours. Throughout the legal proceedings, Davis maintained his innocence. After his conviction, as the jurors prepared to deliberate on the appropriate punishment, Davis asked them to “spare my life,” explaining that he had been convicted for “offenses I didn’t commit.” The jury returned with a death sentence. Davis appealed all the way up to the Georgia Supreme Court. He lost. Then he began filing habeas corpus petitions, first in Georgia state court and then in federal court. He lost again. Then, in 1996, new evidence surfaced. Of the nine crucial prosecution witnesses, seven recanted some or all of their testimony, stating that they had felt pressure to identify Davis as the shooter when he was not. Three witnesses signed sworn statements that Redd Coles had confessed that he was MacPhail’s killer. Davis went back to state court with the new evidence, but the courts refused to hear it, saying it was too late. Davis went back to the federal courts, which agreed that it was too late. Out of options, Davis appealed to the United States Supreme Court, arguing that the new evidence should be heard because he was actually innocent. The “embarrassing question” was back. In a short order issued on Aug. 17, 2009, the Supreme Court instructed a federal trial court judge to hold a hearing so that the recanted testimony and new evidence of Coles’ confession could be aired. Scalia and Thomas issued a blistering dissent. The Supreme Court, Scalia pointed out, had sent the trial judge on a “fool’s errand” because it has “never held that the Constitution forbids the execution of a convicted defendant who has had a full and fair trial but is later able to convince a habeas court that he is ‘actually innocent.’ ” It was pointless to find Davis innocent because innocence, by itself, was not a legal basis to overturn the conviction. 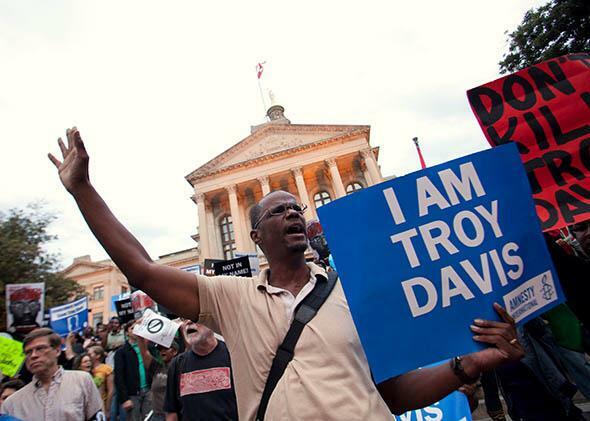 Michael Henry and other protesters for Troy Davis gather on the steps of the Georgia State Capitol in Atlanta on Sept. 20, 2011, the day before Davis’ execution. The trial judge held a hearing nonetheless and concluded that Davis had not shown enough evidence to cast doubt on his conviction. Davis appealed, arguing that the trial judge had shown a “clear hostility” to his case. He lost, appealed, and lost again. Meanwhile, Davis’ case had gained unprecedented international attention. More than a half-million people signed a petition asking the Georgia State Board of Pardons and Paroles to commute Davis’ death sentence. Among the signatories were Archbishop Desmond Tutu, former President Jimmy Carter, and Pope Benedict XVI. The board denied the petition, and President Obama declined to intervene in the case. On Sept. 21, 2011, one hour before Davis was scheduled to be executed, the Supreme Court reviewed his petition. A few hours later, they denied it without comment. Davis was now officially out of mercy, out of appeals, and out of time. Asked to speak his final words, Davis told the MacPhail family that he grieved for their loss. “But,” he said, “I am innocent.” He continued, “For those about to take my life, may God have mercy on your souls.” The official time of death was 11:08 p.m. More than 1,000 people attended the funeral. Whether proof of innocence should be grounds for release—from decades of wrongful imprisonment and even from death—is an “embarrassing question” but not in the way that Scalia meant. It is an embarrassment—it is a scandal—that no such right exists when we know how often the system gets it wrong. Last year alone, 127 men and women were freed from prison after their convictions were overturned. Because of the way that our system is structured, most fall into the category of the “lucky” ones—lucky because cheating, lying, laziness, or negligence made their legal proceedings grossly unfair. There are many more still to be freed. The most conservative estimate is that there are somewhere between 10,000 and 20,000 innocent people locked up in the United States today. How many more Troy Davis cases will the Supreme Court tolerate before it does what is so obviously the right thing? If the execution of an innocent person isn’t cruel and unusual punishment, what is?